One of No 24 Squadron's Buccaneers. 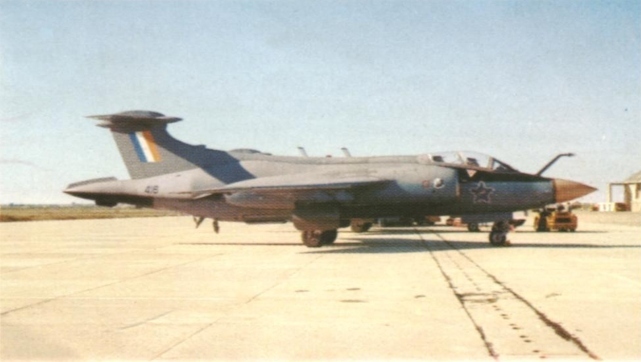 One of the 13 surviving Hawker Siddeley Buccaneer S Mk 50s in service with No 24 Squadron. 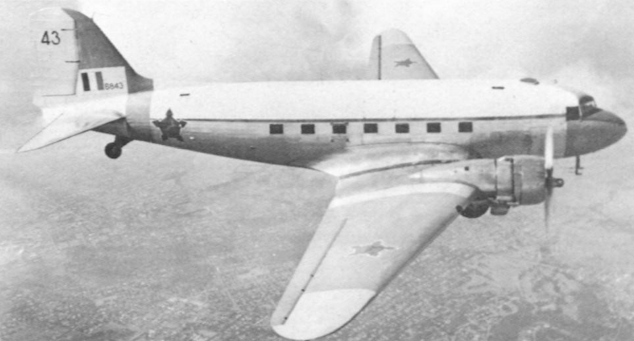 Five Douglas DC-4-1009s have been pressed into service with No 44 Squadron, having previously served with South African Airways. De Havilland Vampire FB Mk 6 and 9 single-seaters are still used at the Advanced Flying School at Pietersburg. The Aermacchi MB 326M is in production in South Africa as the Impala, the example illustrated serving with the Advanced Flying School. A Mirage IIICZ of No 2 Squadron, showing the squadron crest on the tail. Five variants of the Dassault-Breguet Mirage III are currently in service with the South African Air Force, equipping tw o squadrons based at Waterkloof The example illustrated is a Mirage IIICZ in the new camouflage scheme of dark green and buff, with sky undersurfaces. An uncamouflaged Mirage IIIEZ of No 3 Squadron carrying Matra combination rocket pods fuel tanks under the wings. One of the four Mirage IIIZs used for tactical reconnaissance by No 2 Squadron. An Aerospatiale Super Frelon operated by No 15 Squadron. 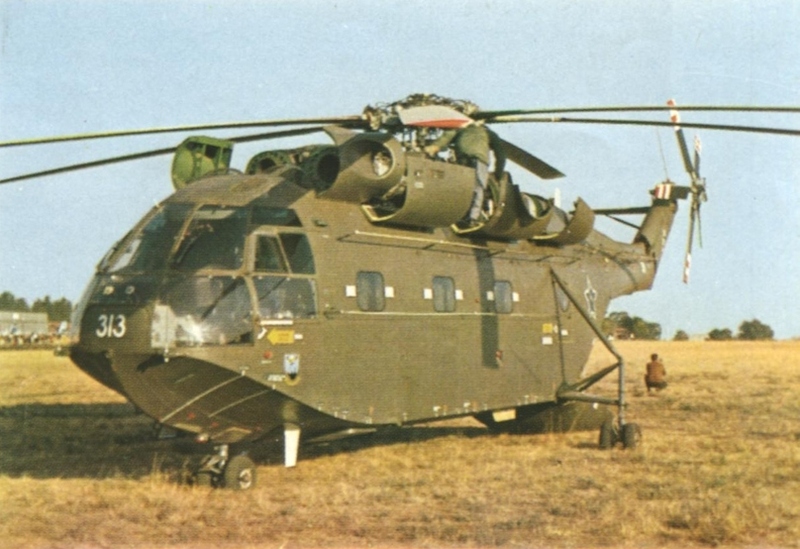 Numerically the most important helicopter in the SAAF today is the Alouette III, about 70 of which have been delivered. For long-range logistics support duties, No 2S Squadron of the SAAF operates seven Lockheed C-130B Hercules (photo) and nine Transall C.160Zs, all from the Waterkloof base. The three Canberra T Mk 4 trainers are used by No 12 Squadron alongside the operational B(I) Mk 12s. For long-range logistics support duties, No 2S Squadron of the SAAF operates seven Lockheed C-130B Hercules and nine Transall C.160Zs (photo), all from the Waterkloof base. A Canadair Sabre 6 of No 1 Squadron, normally based at Pietersburg in the North Transvaal, displayed with a selection of armament. Elderly types still operated by the SAAF in the transport role and on general duties include a single Vickers Viscount 781. One of the Sud Alouette IIs used by the Helicopter Conversion Unit at Ysterplaat. Soon due for replacement, the seven elderly Shackleton MR Mk 3s are operated on long-range patrols from Cape Town. The South African Air Force's small Canberra force, comprising six B(I) Mk 12 bombers and three T Mk 4 trainers, is operated from Waterkloof by No 12 Squadron. Nine specially-equipped Piaggio P.166S Albatross twins are used by No 21 Squadron at Ysterplaat. 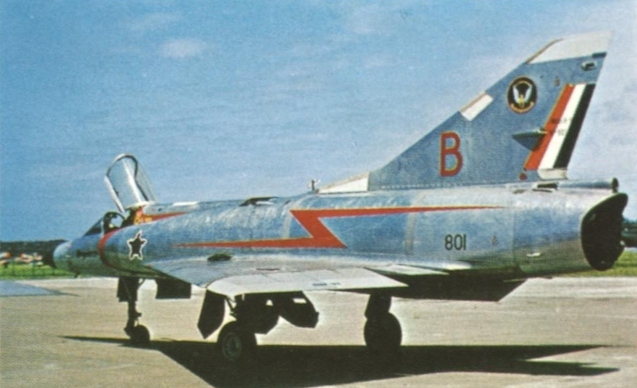 The two-seat Mirage IIIs serving with the SAAF include three IIIBZs (photo) with No 2 Squadron and four IIIDZs with No 3 Squadron. The two-seat Mirage IIIs serving with the SAAF include three IIIBZs with No 2 Squadron and four IIIDZs (photo) with No 3 Squadron.